Prior to Your Coaching Session: You'll receive a checklist and questionnaire via email which you will complete and submit to Coach Janice prior to your coaching session. These documents have been designed to focus your thoughts and provide your coach with the necessary information to optimize your coaching session. 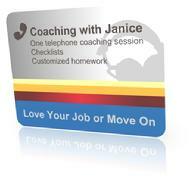 Your Coaching Session: Coach Janice will spend one hour with you either over the telephone or in person (in her Grass Valley office) to explore your thoughts and feelings about you and your job, brainstorm and expand your options, and strategize action steps you can take right away to make a decision that will motivate you to re-engage in your job or take steps to move on. ECap: Within 24 hours of your coaching session you will receive an email (ECap) containing a summary of your coaching session, including action items you have committed to doing. Accountability Check-In: For 30 days after your coaching session, you will have email access to Coach Janice to report on your commitments, brag about your results and/or get further tools to motivate yourself. At the end of 30 days (or sooner), you may decide that you are ready to make some major changes in your life. If so, you may decide to invest in your future by hiring Janice for regular coaching to support you through your transition. Simply email Janice and she will give you a 10% discount on your first month of coaching. Value priced at only $159.00. What is the Best Job for You? A one-on-one coaching session with Coach Janice and an online assessment (MAPP) clarifies your work strengths, learning style and what motivates you. Armed with this knowledge you will be able to organize a job search suited to your strengths or re-negotiate duties at work to become more engaged. Price includes one coaching session, cost of online assessment, narrative and graphical report of assessment results and 30 days of unlimited email contact with Coach Janice to brag about your results, sustain motivation and accountability or simply to ask questions as you move forward. Value priced at only $199.00. Improve work relationships and effectiveness by identifying your strengths and areas needing improvement (via online validated Emotional Intelligence Assessment (measures self-awareness, self-management and social competence) and create strategies and exercises to improve and implement skills. Includes three coaching sessions (via telephone or in person in Grass Valley office), online Emotional Intelligence assessment test and report, accountability via email with Coach Janice between sessions and homework for skill practice. Employers: This a great team building and communication tool. Call for group pricing. With Coach Janice you will explore your thoughts, beliefs and behaviors regarding your personal identity and self-esteem and develop strategies and action items to optimize your confidence at work. This package includes two "live" coaching session (on the telephone or in person at Grass Valley office) with Coach Janice, an ECap (email summary of your sessions), exercises to integrate the coaching between sessions and 30 days of unlimited email contact with Coach Janice to provide accountability, feedback and encouragement. Valued priced at only $299. If you decide to continue coaching, you will be eligible for 10% off of first month of regular coaching fees. Define success for yourself and watch the magic happen. Through one-on-one coaching sessions, homework and exercises, you will explore life's purpose, personal values and beliefs and create a working plan to live your best life yet in 2010...and beyond. Price includes six "45 minutes" weekly coaching sessions (via telephone or in person in Grass Valley office), PDF Sizzling Success Workbook, Success Planning & Tracking Template and email check-ins between coaching sessions. Value Priced at $499. Group Option: Bring Your Friends. Looking for a way to grow and learn with your friends and/or colleagues? Bring 5 others to the Sizzling Success table and we will arrange a mutually convenient time for live group coaching (in my Grass Valley office) or via teleconference to cover this material together and learn from each other. Value priced at only $199 per person, with the organizer receiving a discounted price of $149. Email me directly and I'll send you a flyer and invitation you can send to your friends. If you are able to gather 6 people, including yourself, we are on! Email: info@yrcoach.com- mention Sizzling Success Group Coaching. Transformation begins with your THINKING. Understand and upgrade how you think for better results. You will take an online test (MindScan) which will help you understand your thinking patterns and biases and then receive a coaching session to design strategies to upgrade your personal operating system (your mind, beliefs and emotions). Price includes cost of assessment test, one coaching session with Coach Janice and 30 days of email access to Coach Janice for support, validation and accountability. Valued priced at only $199. Upgrade your personal boundaries and standards to help you live a better life. Price includes one coaching session with Coach Janice, eBook (which includes exercises) and 30 days of unlimited email access to Coach Janice for check-ins, support and accountability.